Saturday, August 4, was an average weekend day. It began with Kim and G getting breakfast from Chick-fil-A while I slept longer. Such a treat. Next, a mid-day birthday party for a child of one of Kim's coworkers gave G some nice fun. Then, a couple stops for shoes & clothes shopping for G (the girl keeps growing!) followed by a light dinner at home. The night was to end with the family enjoying the Columbia walking trail: Kim and I walking with G riding her bike. The first mile and a half were great. 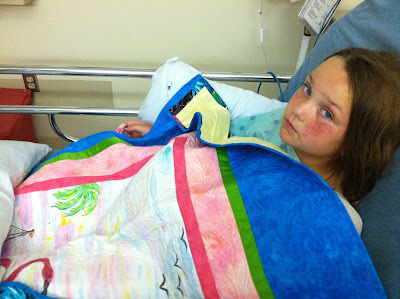 The return trip resulted in a visit to the ER. Georgia learned to ride her bike a few months ago. Although she's had a bike for years, she's rarely had the chance or wanted to ride it. I was wondering when we'd get rid of the training wheels. She learned to ride through a technique of removing the pedals (and training wheels of course) which forced her to focus on balance and steering. After three short sessions, she could easily balance and steer around obstacles. Putting the pedals back on, she could pedal like a breeze. Thanks to John Rhee for showing me this technique. I'd strongly recommend it to anyone! Kim's training for a half-marathon in October and part of her routine is walking 3 miles on Saturday. We had debated whether to go to Lifetime Fitness or walk around the neighborhood. But the weather was right and G wanted to ride her bike on the walking trail. Since my stride is longer, Kim suggested I walk ahead of her so G could enjoy her bike. I tried to keep Georgia within view. Unlike Kim, G and I were unfamiliar with the walking trail. The trail had many twists, walking bridges, and some hills. Nothing that concerned me and apparently nothing that concerned G.
She was so brave. I was thrilled she was enjoying her bike. She was looking forward to when I got my bike and we could ride together. I wish we were that night. Maybe I could've slowed her down. My vivid memory is after walking a mile and half, we were on the return trip. I was walking up a hill and leaving her behind to pass another family on bikes. I encouraged her to keep coming. "You're doing great, honey! Pedal up the hill!" Soon, she passed me as she had done several times on the trail. When she reached the top of the trail's hill, at my pace I could see the path went downhill slightly to the left. As she descended, my heart sunk. "She's going too fast," I thought. Immediately, I imagined she would begin braking if she was going faster than she could handle. She was so brave. This was the girl who barely wanted to go too fast on her bike. Now, she was on a walking trail enjoying the adventure. My pace quickened. Then, the sound of bushes and weeds crunching. She was still out of sight around the bend in the trail. I began running. "Daddy! Daddy! Daddy! Help me! Help!" She was screaming - shrieking - in the most blood-curdling shriek. I got to her in seconds. She was just off the trail, back on the ground, feet almost in the air from neary looking like she'd fallen off a young tree. She was covered in light green sticker bushes. I helped her to her feet slowly while she was still shrieking, sobbing, scared, in pain. The previous family on bikes asked if she was ok and I appreciatively indicated that I thought she was or would be. My voice was calm and soft for her sake and mine as I picked off every sticker twig while looking for cuts, gashes, bones breaking the skin, or anything black and blue. Kim caught up and we both began to patiently try and diagnose any problems. As we consoled her and she calmed down, one thing was becoming very clear: her left arm was hurt. She couldn't pin-point the pain. Her fingers were fine. She could feel and wiggle them, but she couldn't hold her arm down to her the side. She couldn't lift it straight out to the side, either. It wasn't her collar bone. Was it her shoulder? Elbow? Was something broken? Just twisted? We didn't know. Later, I would learn from her what prompted her screaming was trying to push herself up and not being able to use her left arm. All we could do was walk back to the car as quickly as we could, which wasn't a very fast pace. Nor was it close. The car was nearly a mile away. It probably took around 45 minutes. She didn't seem to have much pain so long as she held her left hand with her right hand so that her left forearm was across her belly. She spoke of never wanting to ride her bike, again, and that she shouldn't have ridden it tonight. We focused on the positive, reminding her that she will ride her bike, again. We prayed aloud as we walked. We thought about getting her cleaned up first. Maybe even getting a shower. She was sweaty and had grass & other debris that I hadn't picked off yet. We also needed to put Maddy (our 17 yr old Beagle) in her crate. But on the walk back, it was evident that we needed to quickly take care of the dog and get her to the ER. It probably took another 30 minutes in riding from the trails, to our house, to the hospital. Georgia walked a mile and rode in a car with a broken arm. She's amazing. She was so brave. At Howard General, she received a sling and X-rays before we learned that her humerus was broken close to the growth plate. The orthopedic surgeon who "happen" to be on call, suggested that the break was in a great place to heal up nicely and that surgery likely wouldn't be needed. From the doctors and nurses to this affirming piece of information, God was with us that evening. Nothing "just happened." That night, after we got her to bed with her medication, the emotion of the day came out. I had broken our child. I was the last one to see her go down that hill. I'm her father. I'm suppose to protect her. Although I knew there was nothing that could've been done to stop her from crashing, I felt responsible. Helpless. Kim assured me that I wasn't to blame. We both were still amped up on emotions and adrenalin. This has been the hardest thing I've gone through in a while. My baby girl is broken. Moving around for her is both a mental and physical game right now. She's concerned about what movements will hurt her arm. She has to psych herself up before getting out of bed or sitting down. Each time, I'm supporting her arm, some of which I know means the sling needs some adjustment and some it is comfort for her. Some of it is pain but some of it is the fear of pain. Both were producing the same level of shrieking. These shrieks were too similar to how I found her off the trail. In trying to be there for her and help her through this, I was falling apart. Several times, after spending time with her watching a movie playing a computer game, or just talking about random things I walked away to weep. Sunday night, I was sobbing in the kitchen. Monday, Georgia saw me cry twice. I hadn't wanted her to see me cry but there it was. But this also allowed us as a family and for G and I to talk about how prayer is answered and why things happen. We could not go through this trial without a Kingdom focus and context. It's amazing how God provides the right people at the right time, to know family and friends are praying, to get past all the emotions and focus on the faith in knowing it's all in God's control. Monday was a much better day. We encouraged her to go downstairs, sit on the couch, positioned a bunch of pillows around her, and she watched some TV. Then, some of her friends in the neighborhood visited her. The life poured back into her through those visits. She started singing silly sounds, giggling, and just being more like G.
With each glimpse of the usual G, I felt myself relax more. As she was returning to normal, so was I. Our new normal will only be temporary. We'll return to our regular normal soon enough. But I couldn't imagine going through this without family, friends, and everyone's prayer support. There's power in prayer - always. In Jesus' name - amen. UPDATE: An answer to prayer and affirmation of what we were told Saturday night came August 8: Georgia doesn't need surgery and that she is healing up very nicely. She won't even need a cast. The splint will be removed next Tuesday and she will only wear a sling for several weeks. I'm amazed at how quickly children heal and how special God designed the human body. A few things...so glad Maddy is still kickin it! Regular normal and Rick Garner just don't go together and WHY did you let that poor child walk a whole mile back to the car? You should have carried her DAD! Great story! Love y'all. May-May is 17 years old! She just keeps ticking. I'm glad you recognize the states of normalcy. As heroic and dadly carrying her might sound, there's no way in her condition either of us could've made that happen.